One Lucky Duck Giveaway! And 15% Off! Gift Ideas Galore. Holiday offering for you, my wonderful readers! I'm excited to bring you guys a giveaway from one of my favorite brands: One Lucky Duck. Enter to win a $50 e-certificate to the OneLuckyDuck.com online store. But wait! There's more. Since you are reading this post, you get a treat: a holiday discount code for 15% off any One Lucky Duck e-store purchase. 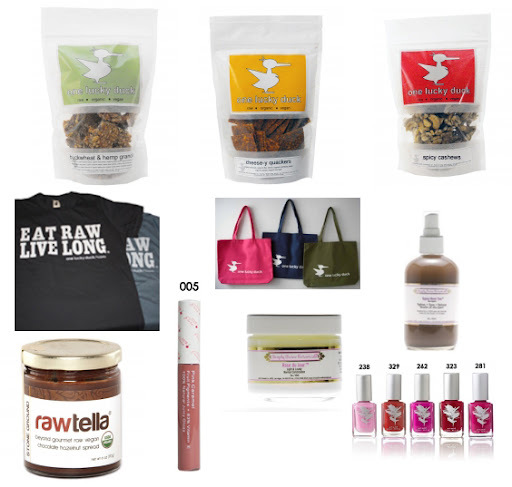 So get all your holiday shopping done in one healthy, happy, vegan swoop! 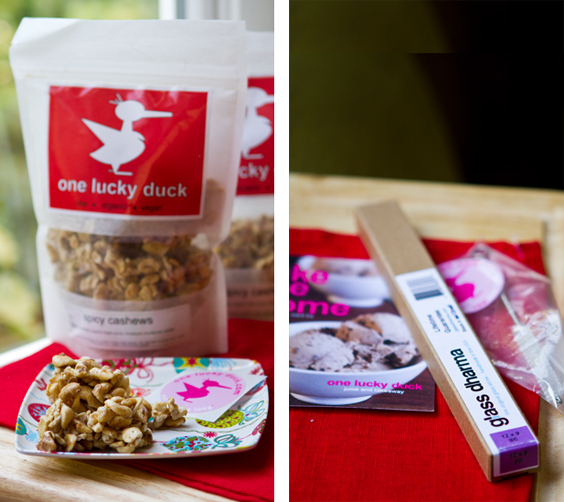 And also ahead, I'll share my Top 10 favorite One Lucky Duck products/gift ideas and why I love them. Happy holiday giveaway details ahead!.. One Lucky Duck NYC. There are a lot of things that I miss about living in NYC. Babycakes' Toasties. Visiting the Moo Shoes kitty cats. Central Park in spring. The Union Square Greenmarket. A blanket of snowfall covering Washington Square Park. Broadway. And grabbing a fresh juice, and side o' Mallomar, from One Lucky Duck takeaway. Or having a fancy night out at Pure Food and Wine. 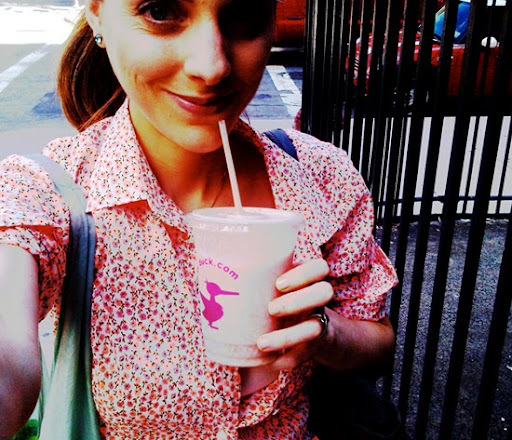 Ah, if you are in NYC go visit Sarma's spots in person for amazing food, treats and sips.. I'm a huge fan of Sarma's inspiring brand/raw vegan empire. So since I'm Cali-dreaming out here in Los Angeles for a while, I love that I can get OLD goodies delivered to my doorstep. Now if only they shipped that darn amazing raw taco salad. Holiday Discount for Healthy. Happy. Life. Readers: 15% off any OneLuckyDuck.com purchase! Coupon Code: LUCKYLUNCH (all caps, no space, no quotes!) The code will expire January 31st, 2012. And now for the giveaway details.. THE GIVEAWAY HAS ENDED. Congrats to the winner: Jaclyn W.
*a coupon code will be emailed to the winner for immediate use at oneluckyduck.com! *ENTER -> enter by commenting on this post. You must comment to gain initial entry into the giveaway. Comment by telling me what your favorite One Lucky Duck store item is OR what you might buy if you win. * tweet this post and include @replies as shown: " I just entered the @OneLuckyDuck Giveaway hosted by @Lunchboxbunch - enter here: http://bit.ly/tEhDDI "
NOTE: for additional entries add the tags #tweet and/or #FB to your comment so I know that you shared. This granola is amazing! I tried it for the first time a few days ago and nearly ate the entire bag. It is slightly moist and chewy - yest nutty and crisp at the same time. The flavor has a mild sweetness that is just right for a healthy treat or snack any time of day. This granola rocks. My first love from the edible snacks department of OLD. These savory, cheezy squares are quite addictive and will remind you of devouring handfuls of cheez-its as a kid. Only these little squares are dairy-free. Packed with super healthy ingredients like nutritional yeast. My husband goes gaga for these treats. I can't leave him alone with a bag. Yes, it is like "Nutella" for the raw, vegan (chocolate loving) folks out there. This stuff is creamy, rich and totally blissful. Eat it with a spoon or use in smoothies, blend with vegan ice cream or spread it on anything that needs a boost of chocolate. Rawtella comes in a variety of flavors like mint and coffee. I just bought a tube of this yummy lip gloss and love it. Shiny, rich color and totally natural. 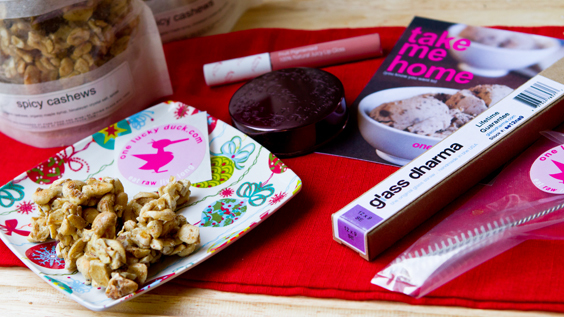 So you won't feel bad about "eating it off" as so often happens with lip gloss. Fruit pigments are oh so pretty. Love that, "All the antioxidants and vitamins in fruits are in the actual color, so you will be applying all the healthy nutrients of the fruits directly on your skin!" Non-toxic nail polish. Need I say more? I simply can't use the drug store brands of polish anymore. Chemicals, yuck. I love knowing that even my fingertips are getting a healthy glow. Priti Polishes are "free from the three worst chemicals (commonly found in polish): toluene, formaldehyde and dibutyl phthalate." Wide variety of colors too! And don't forget the non-toxic "Soy Remover" too! I love a good toner. Love it. And this rose-essenced toner that comes in a spritzer bottle is pretty fabulous. I've bought it a few times and spritz it on my face whenever I need a hydrating perk to my skin. Plus who doesn't love that it is, "Inspired by a 1500-year old formula made by Gypsies for the Queen of Hungary." Glass straws are a MUST have for any smoothie fan! Actually I think every household should have a few. These are awesome. You won't believe how chilled and extra cool your smoothie tastes when sipped from these silky glass straws. Lifetime guarantee! Super durable. Don't forget to buy a straw cleaning brush too. These straws come in straight or slightly tilted. I own both. The tee is super soft and slightly springy which I love. Light and super cute with jeans. I love my hot pink tote bag too. Super durable and heavy duty. Both items are high quality and show your spirit for all things Duck. I adore this rose-scented cream. It is thick and rich yet goes on silky. Super hydrating, yet never makes my face feel greasy. Nourishing. Perfect moisturizer for dry seasonal months. Another favorite of my husband's! 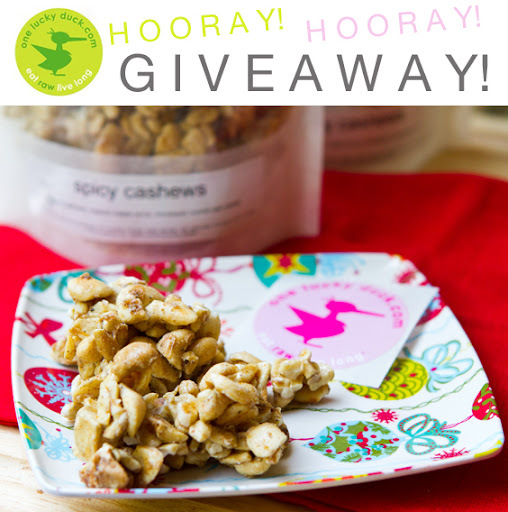 He craves these salty, spicy, slightly sweet cashews. High quality nuts. Perfect for snacking any time of day. I can never buy just one bag of these because they are usually gone by the next day and we are all left craving more! 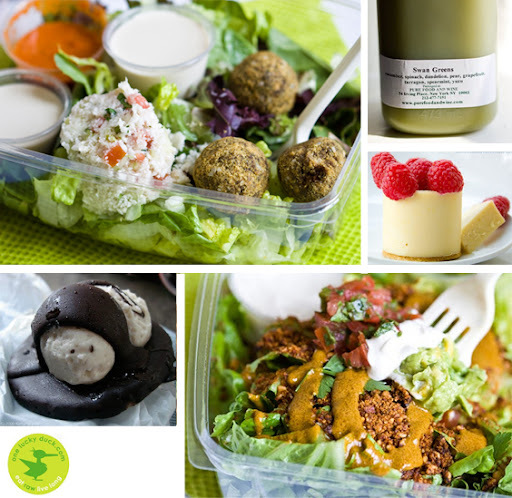 * Raw Eats NYC: featuring OLD's yummies. * Sarma's Veggie Girl Power Interview! And here are more OLD products I LOVE... I've crossed the line to gushing haven't I? * Goldenberries - sweet-tart, chewy, snacking bliss! * Blondie Macaroons - amazing coconut-lover's treat. * Cocoa Pigmented Bronzer - chocolate for your face. Get cocoa-kissed. Just bought this and love it. * RMS Living Luminizer - fab face/body cream if you want a little help getting that "glow"
* Alkaitis Organic Night Cream - not cheap, but worth it! My skin loves this stuff. * Raw Cacao Powder - pantry staple for any healthy cook or baker! * Chocolate Truffles - chocolate-lover's gift perfection. * Pumpkinseed Oil - fancy pants oil, but oh so good for you. * Rebounder - Aka trampoline. I don't own this. But I really want it. Would bounce all day long. * Gift Sets! Yes Sarma has a whole slew of OLD gift sets all picked out for you. I think any of these would make your gift recipient very happy and healthy. Give the gift of GLOW! Be sure to connect with One Lucky Duck and tell them how much you love them as well! Note: this is not a sponsored post. I receive nothing for hosting this giveaway. Except of course the joy and satisfaction of bringing you lovely readers a discount code and possible prize.